I have instructed my scribe and general factotum to write this communication to you even though he’s a fool. Albeit a good-hearted, well-meaning fool. Let me explain. Anyway, my scribe and factotum, knowing my admiration for the Queen thought it would be a good idea for me to dress like her. Unfortunately, he didn’t get it right. No frumpy dress in some bright colour. (Canary yellow would have been good.) And no matching hat. No, he goes and gets me a ruff. It’s Elizabeth II I want to be like, not Elizabeth I! I just look ridiculous. It was quite a fuss getting the ruff made and fitted. 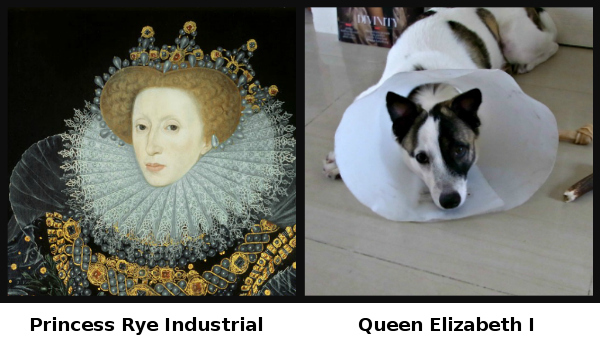 My factotum took me to an establishment specialising in providing dogs with ruffs. And I had to stay there for several days whilst it was done. I think the tailor wasn’t very good though. He must have slipped and cut me on my tummy whilst I was asleep. He then sewed a few stitches there, perhaps thinking I wouldn’t notice what had happened. I’m really surprised that my factotum doesn’t know the difference between the Virgin Queen and Brenda. After I remonstrated with him, and as he walked away, I’m sure I heard him mutter “you may not ever be the virgin queen, but now you’ll always be the virgin princess”. I wonder what he meant?